Sitting in the Music Room listening to prize-winning musicians from many countries has not only given me enormous pleasure, hearing the classics played with such fervor and skill, but has also broadened my taste for new and unusual music. We’re all sharing the experience together; sometimes the room just vibrates with excitement. I am delighted to be there, and to help the staff and the audience with the tickets, the programs, and the questions that arise. We can be an extra hand. The musicians have extremely busy schedules, and generally leave soon after the concert. Occasionally, however, the musicians have time for a brief foray into the gallery, and I take them to see Renoir’s Luncheon of the Boating Party. The Renoir and Friends: Luncheon of the Boating Party exhibition and excellent panel presentation about the painting helped me to deepen my knowledge of that treasure. I am about 90% retired as a professor of political communication, having taught at the University at Albany, State University of New York for 37 years, and then at the University of Maryland, College Park, in the Department of Communication. I still work with a few graduate students at UMD; publish occasionally on topics such as communication in the presidential primaries; and attend professional conventions. 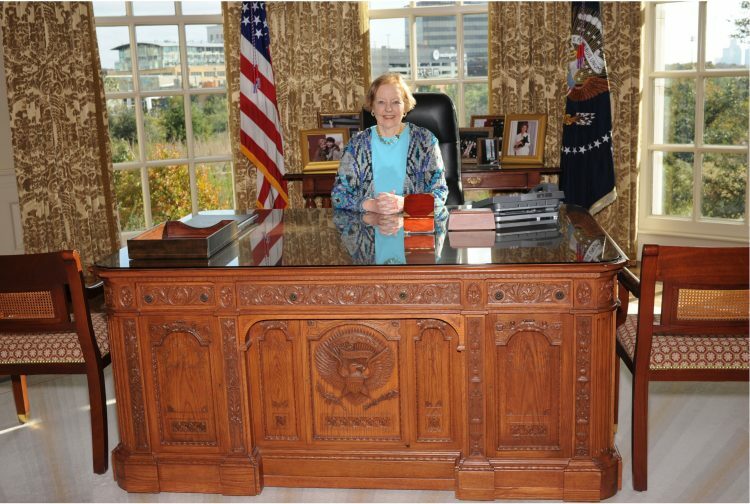 In my photo, I’m sitting in the model of the Oval Office at the George W. Bush Presidential Library in Dallas, happy that more and more women are stepping forward and running for office. 2018 should be a banner year for female candidates. 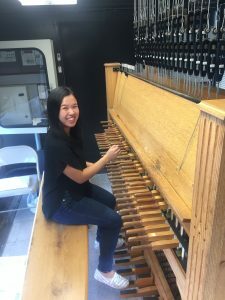 For the music volunteers, the Music Room is a logical favorite. The oak paneling, the high windows, the beautiful paintings, and the historical ambiance (these concerts began in 1941) provide the perfect setting for the glorious chamber music. I would have to choose several—human scale, calm, and intense focus on creativity. Share a fun fact about you. I like the funnies, and read some comic strips every day in the Washington Post. What will happen tomorrow in Spider Man, Pickles, Mark Trail, Peanuts, Sally Forth, and Doonesbury? I fell in love with DC on the Washington Semester Plan in college, and can’t imagine a better place to be. The Phillips is a vital part of my life.